CBI vs CBI: Alok Verma and his deputy Rakesh Asthana were both sent on leave in October amid a bitter feud between the CBI's top two. The government said the two were fighting like "kilkenny cats". 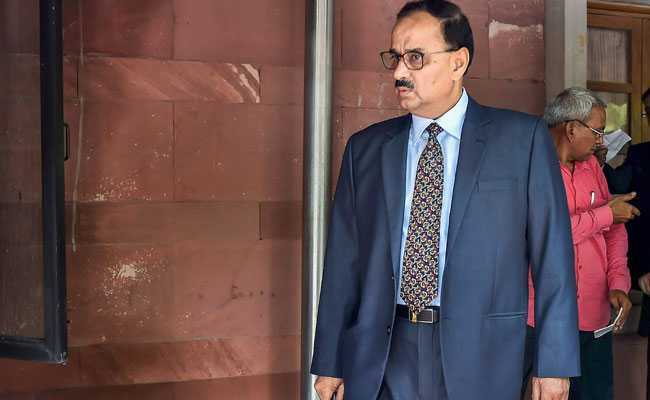 Alok Verma has been reinstated as the CBI chief by the Supreme Court, three months after the government divested him of his powers and sent him on forced leave. Alok Verma and his deputy Rakesh Asthana were both sent on leave in October amid a bitter feud between the CBI's top two. Mr Verma challenged the move saying it went against the rules that mandate that the CBI chief has two years in office. The government argued that it had no option but to send both officers on leave since they were fighting like "kilkenny cats". Congress chief Rahul Gandhi tweets: "The truth of Rafale will destroy Mr Modi. It's only a question of time before full evidence of his role in the theft of 30,000 Cr. becomes public. Congratulations to the SC for upholding the law." "Narendra Modi govt's autocratic midnight coup and an attempt to subvert investigating institutions has received a major setback through SC judgement which reinstated #AlokVerma back as #CBIChief. This is a big win against despots &will push @BJP4India back for any renewed attempts," tweets former Chief Minister of Karnataka Siddaramaiah. The Communist Party of India-Marxist (CPI-M) says the Supreme Court judgment reinstating CBI Director Alok Verma is a strong indictment of Narendra Modi and said the Prime Minister should have quit. The CPI-M says the apex court verdict "shows how the Modi government has subverted and subordinated every single rule and norm in the functioning of institutions like the CBI to suit its narrow political interests". "The judgement is a strong indictment of the Modi government and specifically the Prime Minister himself as the Department of Personnel and Training under which the CBI functions is in his charge. If the Prime Minister had a conscience, he should have resigned. This is one more reason why he and his government must be removed from office by the people in the forthcoming elections," it says. Senior Supreme Court advocate Prashant Bhushan describes the Supreme Court order to reinstate Alok Verma as the Central Bureau of Investigation (CBI) Director as a "partial victory", as he was not been given full powers. "The Supreme Court has today quashed the government's decision and the CVC's (Central Vigilance Commission) decision to divest Verma of his powers as the CBI Director and they have restored him as CBI director," Mr Bhushan says. "But strangely quashing the orders divesting him as CBI Director and despite restoring him, the court has said that he will not take major policy decision till such time that this high powered committee comprising the Prime Minister, Leader of Opposition and Chief Justice of India meets and considers the matter," he adds. She has tweeted: "Welcome SC's decision to reinstate Alok Verma as CBI Director. Reinstates belief in independent institutions of our democracy that are its pillars. Time for the Central gov to stop misusing its influence to arm twist investigative agencies like NIA and CBI for political vendetta." "The government had taken this action of sending two senior officers of the CBI on leave on the recommendation of the Central Vigilance Commission (CVC)," Finance Minister Arun Jaitley tells news agency ANI. Will comply with Supreme Court's order, says Finance Minister Arun Jaitley. "The court has taken a balanced view." "Have not got an opportunity to read the judgement. Only after reading the judgement, the government will respond to the verdict if needed," he adds. Senior Congress leader Mallikarjun Kharge, on Supreme Court's decision, tells news agency ANI: "We are not against one individual... welcome Supreme Court's judgement, it's a lesson for (the) government. Today, you will use these agencies to pressurise people, tomorrow somebody else will. What will happen to democracy then?" Transfer of the director (Alok Verma) without the consent of the selection committee negates the legislative intent that is to ensure independence of the Central Bureau of Investigation, says Supreme Court. Delhi Chief Minister Arvind Kejriwal tweets: "SC reinstating CBI director Alok Verma is a direct indictment of the PM. Modi govt has ruined all institutions and democracy in our country. Wasn't CBI director illegally removed at midnight to stall the probe in Rafale scam which directly leads to PM himself?" Congress tweets on the Supreme Court verdict. "We welcome the Supreme Court's verdict lambasting the govt. against their illegal removal of Alok Verma as CBI Director. The SC has reinstated Alok Verma as director." Supreme Court says, the government should have referred to the Select Committee consisting of the Chief Justice of India, Prime Minister and Leader of Opposition to initiate Alok Verma's removal. Supreme Court says the High Power Committee under DSPE Act to act within a week to consider Alok Verma's case, according to news agency ANI. Only the panel that appoints the CBI chief should have been consulted, says Supreme Court. However, at present, Alok Verma cannot take any major policy decisions, says Supreme Court. Supreme Court strikes down CBI Chief Alok Verma's removal. Pronouncement of judgment commences in Supreme Court. Chief Justice of India Ranjan Gogoi is on leave today and the judgement on CBI Director Alok Verma's plea will be pronounced by Justice Sanjay Kishan Kaul and KM Joseph in court number 12. The Supreme Court is hearing Alok Verma's petition against the government's action and his response to a vigilance report on him. The case is centred on corruption charges swapped by Alok Verma and Rakesh Asthana. The CBI Director has been accused by Mr Asthana of taking bribe from a Hyderabad-based businessman being investigated by the agency. Mr Verma has accused Mr Asthana of the same crime.